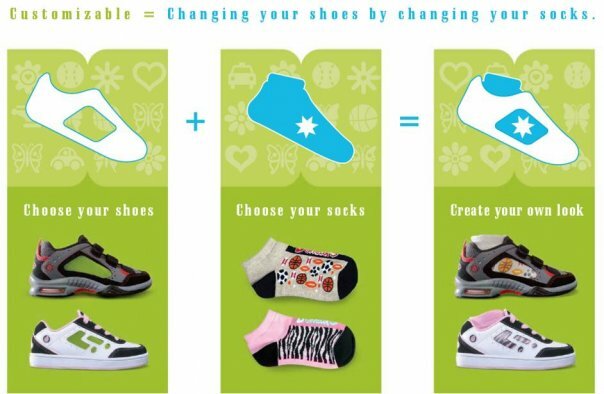 U*neaks patented customizable footwear are sneaker style shoes with side clear panel windows and specially designed socks that allow kids to continuously customize their shoes by simply changing their socks. Pair the shoes with any of U*neaks double-sided decorated socks for footwear that’s fun and chock full of personality. At first glance I was impressed with the design of U*neaks footwear. As a mother, I know how important it is to let my children express their individuality through their clothing & footwear. When it comes to shoes, princess L has NO problem letting me know exactly what she likes! She strives for comfort and style( it's very hard to find both ). If the princess is not comfortable she will remove her shoes~ no matter where we are! We sat down and looked at the styles available online, she identified the shoes that she loved ( the Pearlized Pink Paris z-strap ~pictured above top left), and various designs that were available in the ankle socks. When they arrived her eyes lit up when the box opened. She wanted to try on all of the socks, to see how they changed the look of the shoes, and was genuinely excited. The design is genius, it allows your children to change their look with one pair of shoes, rather than purchasing several pairs of shoes, you can change the shoes to match your child's attire/mood daily. The princess is comfortable and confident in her new U*neaks, and she draws attention to them everywhere we go. She has even done impromptu tutorials on her new sneakers in the grocery store with complete strangers (that's the kinda girl she is :). When she loves something you know it! I feel wonderful about her reaction, and now we will be shopping for another pair for big brother B. When he saw them he said he had to have a pair too. You can feel confident in the quality of the shoes as well. They are constructed from quality materials, allowing for style while still being sturdy enough to handle the daily adventures of a youngster. Allow your child to express their unique personality and style with U*neaks! One Lucky Reader will receive a pair of U*Neaks of their choice & Two Pairs of Socks! 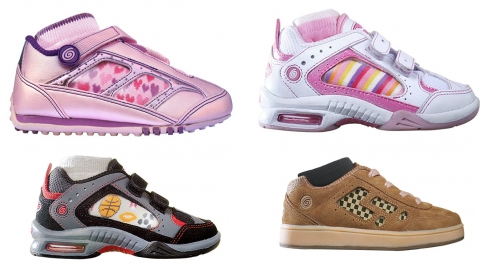 Leave a comment~ Which pair of U*neaks would you love to have for your little one? The comment is considered your entry. Entry to this giveaway ends at 12pm PST September 30, 2010. Winner's are chosen randomly through random.org. The winner will be announced in a post within 7 days of the giveaway ending, and contacted through email. The winner will have 48 hrs. to respond or another winner will be chosen. i would love the red and black boomerang boy shoes. too cute! I follow. The White valley lace girls shoes rock! I love Gray/Yellow Boomerang. What an awesome idea! I like the Gray/Yellow Boomerang boys shoes. I like the black/red boomerangs for boys! I like the boys Gray/Yellow Boomerang. grabbed your button - www.fairygoodmommy.com on R side. 2 grabbed your button - www.fairygoodmommy.com on R side. 3 grabbed your button - www.fairygoodmommy.com on R side. 4 grabbed your button - www.fairygoodmommy.com on R side. 5 grabbed your button - www.fairygoodmommy.com on R side. grabbed Mommy Approved Button - www.fairygoodmommy.com on L side. 2 grabbed Mommy Approved Button - www.fairygoodmommy.com on L side. 3 grabbed Mommy Approved Button - www.fairygoodmommy.com on L side. 4 grabbed Mommy Approved Button - www.fairygoodmommy.com on L side. I Like the Black/Red Boomerang shoes with the Sports 2 Crew Socks but also the Graffiti/Flames socks.